I'm guessing by now quite a few of you have seen my social media pics of the Birthday Parties I throw for my little ones. We decided a long time ago that we don't throw a party every year for birthdays but when we do, we go all out. 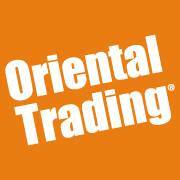 It's for this exact reason I discovered the next brand which I would also bet you've heard of - Oriental Trading. We love to party hard in this family regardless of celebration. Parties and Holidays of any kind can be quite costly especially if you celebrate like we do! By now you should also know we are die hard Halloween freaks and we've turned our children onto the same obsession. It's by far my favorite holiday for more reasons than I can count and our family just loves to show our love for the holiday in every way possible. We start decorating Labor Day weekend since we have so many boxes of decorations. We even leave up half of our "appropriate" decorations most of the year. We throw a lil' party for the lil' ones and a big party for the adults each year. 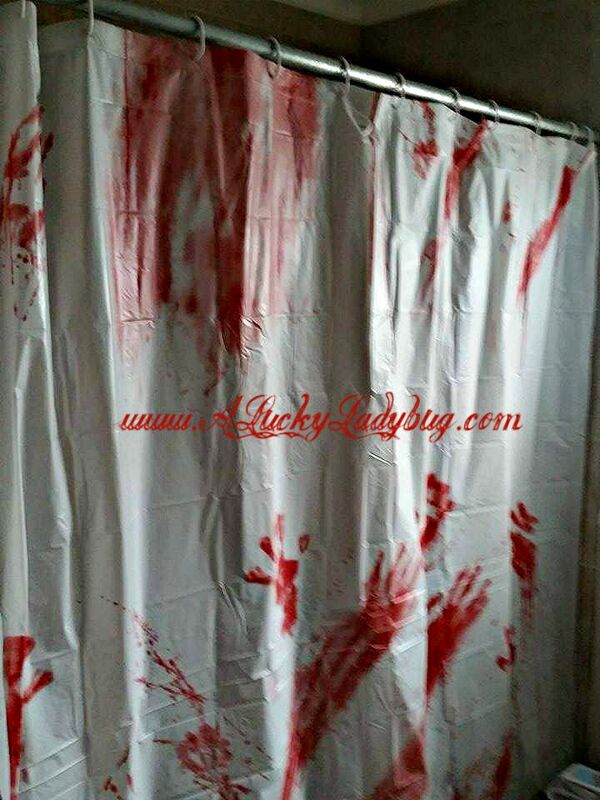 Our decorations get more extreme each year as does our obsession sharing all things Halloween related. While we have a ton of fun doing so, it has become crazy costly and we've had to cut back in past years. However, after discovering such an amazing company like Oriental Trading, we've discovered new ways to save while still celebrating these birthdays with our friends and family. Each year our Halloween is able to grow bigger than the previous year while still spending less than before. Oriental Trading is "the nation's largest direct merchant of value-priced party supplies, arts and crafts, toys and novelties, and a leading provider of school supplies and affordable home décor and giftware. OTC has been recognized as one of the Top 100 Internet Retailers and one of the Top 50 Catalog Companies." 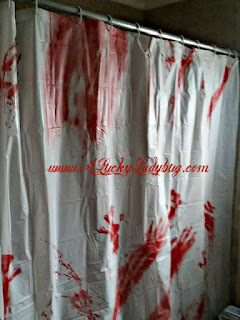 With over 500 Halloween decorations alone, there is guaranteed to be something for everyone and believe me you could spend hours shopping on their site. 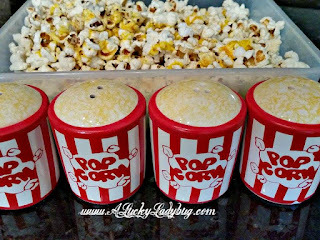 I was sent over a variety of themed products (which I picked out) to review with the idea of creating the perfect Halloween season for every age in our family! I was able to pick out a bunch of items for both of my boys to hand out in their classes for the trick or treating parties without going broke or feeling like a cheap parent. 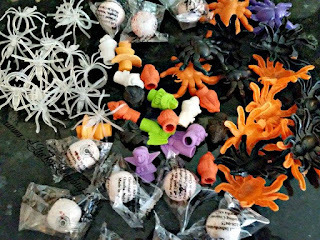 I grabbed the Jumping Spiders (144 pc), the Halloween Pencil Top Erasers (144 pc), the Glow-in-the-Dark Spider Rings (144 pc), and the Gumball Eyes (66 pc), ALL for under $18 for TWO classrooms filled with kids! 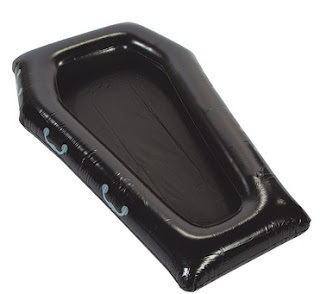 Not only was I able to grab these items for the kids, I found a Bloody Shower Curtain, 2 sets of 60 Count LED Lights (purple and orange), and (2) Inflatable Coffin Buffet's for all our gruesome food for the Annual Adult's Halloween Bash for under $48 for everything! Between the kids and myself I spent under $66, leaving me with more money for foods and even more decor from Oriental Trading. I think this is by far better pricing than you can find anywhere and I know where we will be purchasing our party supplies from anytime we've got an event to plan! Recommendation: Go check this site out! They have just about anything you can imagine and more. You will find it is totally worth a look and the prices are very reasonable and less than anywhere else I've found so far. I cannot begin to brag enough about this company or the countless hours you can spend shopping on their website! 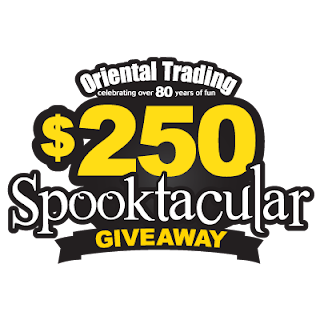 Oriental Trading is giving away $250 in Halloween products of your choice. 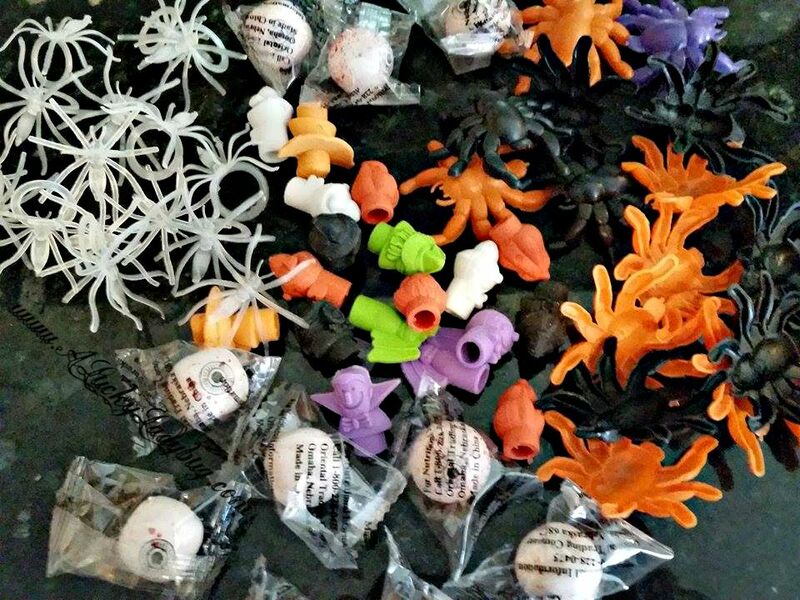 Visit www.spooktaculargiveaway.com today and enter to win a weekly prize. Plus, they’re giving away a $25 Oriental Trading gift card every day! Contest ends October 17, 2015.